The Colorow trail is located on BLM managed land in New Castle, Colorado. The trail begins in the Castle Valley Ranch subdivision where it climbs the mountain past a water tank to an overlook that sits high on the hill overlooking the town of New Castle and the valley below. People hiking the trail usually begin from a trailhead near the golf course or from the one on Lariat Trail Street. Many times they hike up to the overlook and return by the same route to their vehicle but mountain bikers usually complete the trail as a loop. NOTE: To safeguard big game animals the trail is closed between December 1 and March 31. The trail is named after a Ute Indian Chief name Colorow that befriended the founder of New Castle. 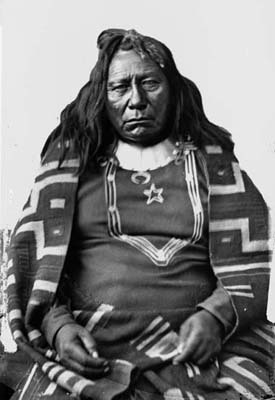 Colorow was a member of the White River Utes and has an interesting history that you can read about online. Colorow figured prominently in the Battle of Milk Creek (one of the last battles of the Indian Wars) and the Meeker Massacre. Both conflicts were prime examples of a grand failure to communicate. Without good directions the trailhead can be hard to find. From the middle of the town of New Castle turn north onto 7th Street. Stay on the main road which soon becomes Midland Avenue until you reach Castle Valley Blvd. where you make a right turn. Go a short distance and turn left onto Alder Avenue. Follow Alder Avenue until you get to Lariat Loop where you will turn left once again. Follow Lariat Loop to Lariat Trail and turn up the street where there is room for several vehicles to park just past the last house. Be sure not to block the road as it is used by city personnel to get to the water tank. Here is an animation of the street signs at each of the turns, beginning with 7th Street, that might make the area seem more familiar when you arrive. The first part of the trail follows the road as it heads uphill to the water storage tank. The road ends at the water tank. The singletrack can be picked up by going around the west side of the tank to where it begins. As the singletrack climbs continually up the mountain it is traveling through a pinion and juniper forest. The climb seems relentless for the first mile or so. An occasional switchback mitigates it a little but there are places where the grade gets as high as 40%. That coupled with a few rocky outcrops makes this trail a real workout. 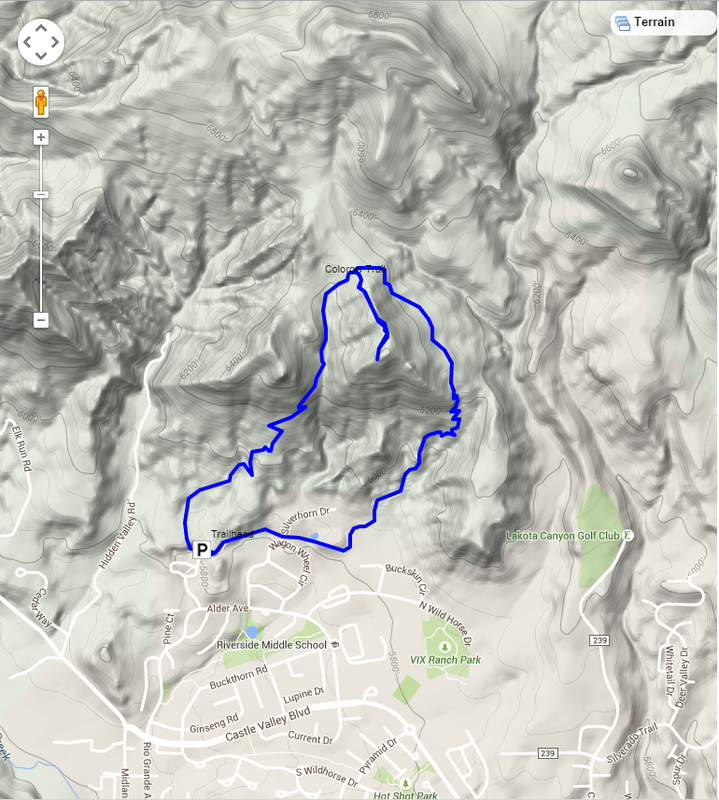 The total elevation gain, which takes into account places where the trail makes short descents and later reclaims the lost elevation, comes out to 977 feet spread out over 1.6 miles. That also includes the spur trail that runs up to the overlook. One of the nicest parts of the trail comes up as it passes through a shallow valley in the saddle of the ridge between two of the peaks. The spur trail that leads up to the overlook comes up at the 1.15 mile point. 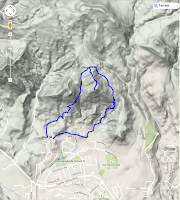 The spur adds just over a half mile to the total distance along with an additional 114 feet of elevation gain. Since we did the spur trail for this post the extra half mile is already included in the round trip distance. The photo of the overlook is about as nice as the valley below. Not that the valley isn't nice also. We just liked the overlook itself. Looking down you can see the town of New Castle, the Colorado River and Interstate 70. Looking out across the landscape you can see all kinds of mountains. When we were kids we used to call the mountain on the other side of the river Fire Mountain because it was always smoking from one of the coal seams inside of it that was burning. Whether it is the same coal seam that caused the fire by that name is something someone else will have to say. After returning from the overlook to the main trail and proceeding around the loop there is a fork that may cause a bit of consternation. To continue around the loop follow the branch to the right. From the overlook the rest of the loop is all downhill with one or two little bumps thrown in. 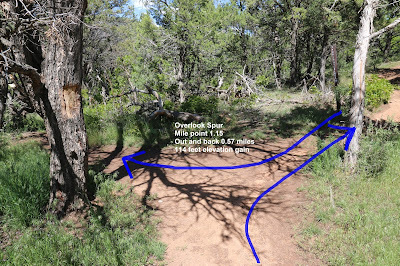 Just past the 2 mile point, including the out and back to the overlook, there is another fork in the trail where we think the left branch leads down to the golf course. We met a couple of guys that were hiking up to the overlook that said they began at the golf course and this is the only fork we noticed going in that direction. There are a series of switchbacks on this side of the mountain that are infamous with anyone that has ridden the trail. Most other riders seemed to be coming up them but it wasn't too bad at all going down them. The side of the mountain is pretty steep along this part of the trail. At the base of the mountain there are several side trails that spill off into the subdivision. We chose to stay on the singletrack but we could just have well popped out onto one of the streets and rode pavement the rest of the way. There are a couple of places where it is a little hard to figure out which way to go but we were able to guess right every time so it must not have been that difficult. From the last picture you can get an idea of what the parking area looks like. 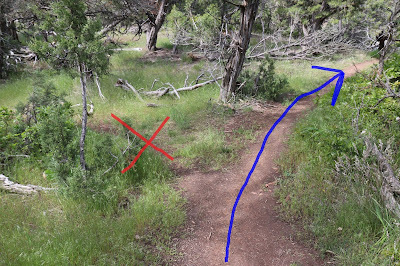 There isn't anything that says the trail isn't open to horseback riding but as you can see there isn't anywhere to turn around a horse trailer and not much room to park one either. 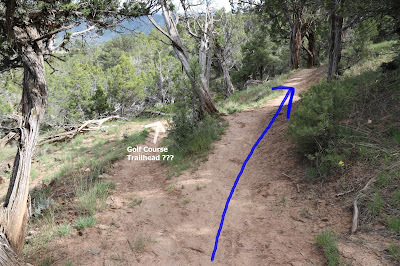 The Colorow trail is a difficult, but worthwhile mountain bike trail, and a great trail for hiking and trail running. There should be enough pictures in the slideshow to give a person a real good idea of what the trail is like. If you would like to see it for yourself then all you have to do is 'Take a hike'.